The most bang for your salary-cap buck? 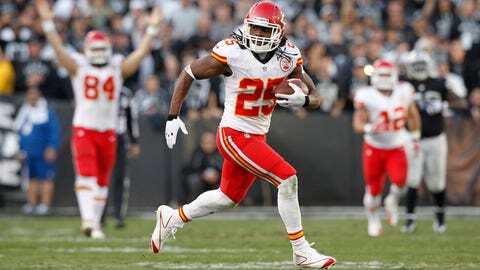 Jamaal Charles, plain and simple. According to the website Spotrac.com, the top dozen highest-paid running backs in the NFL, in terms of cap number, have cost their respective teams an average of $7,718.50 per yard from scrimmage this fall. Charles’ clip with the Kansas City Chiefs: $2,358.39. Of the 12 most moneyed ball-carriers on the circuit, that’s not just the single lowest per-yard take in the bunch. It’s the lowest by about $300 over No. 11, Philadelphia’s LeSean McCoy ($2,655.14). And it’s nearly $2,000 per yard lower than the tailback at No. 10, Chicago’s Matt Forte ($4,200.67). Hall of Famer? Time will tell. "I think I’ve always had a toughness and I always have been a hard worker," says Charles, who leads the Chiefs in carries (246), rushing yards (1,181), rushing touchdowns (11), targets (98), catches (65), receiving yards (655) and receiving touchdowns (seven). "I just took a lesson from being hurt (a torn ACL in September 2011). "I just never take anything for granted, because you never want to miss out on an opportunity that you never get back. You never gain a step on being hurt. Because people forget about you, especially when you get hurt. I just take a lot from when I tore my ACL. I know how to approach things differently and never take for granted who I am today." A beast, a holy terror, a pylon magnet — take your pick. Last Sunday, Charles became the first back in the history of the NFL to notch four receiving touchdowns and one rushing touchdown in the same tilt. And a sixth score would’ve tied him with the great Gale Sayers for the most touchdowns ever by a single player in a single contest. "I think he’s got a lot more great plays in him," tackle Donald Stephenson says. "He’s getting better every year. And I don’t think we’ve seen that (signature) play yet. "He’s a guy who can catch the ball out of the backfield and do something with it. He runs routes, you can (split) him out wide. So it’s not like he’s just taking handoffs in the backfield. He does that and more. And he blocks like one of those bigger-type running backs. If you ask me, right now, he’s the best in the league." "There (are) so few guys that are out there on the field for all of the situations that Jamaal (Charles) is out there," quarterback Alex Smith says. "To have a guy who is so talented in the pass game that is still in there in short-yardage and goal line just doesn’t happen. It doesn’t happen. To be able to have him out there and be able to do so many things, he’s got so many different tools, I think it’s everybody’s dream — quarterbacks, coaches." Executives, too. For all the stick he’s taken — much of it deserved — the five-year, $32.5 million cap-friendly extension that Charles agreed to in December 2010 might be former general manager Scott Pioli’s most enduring legacy with the club. The top five NFL running back cap numbers belong to Minnesota’s Adrian Peterson ($13.9 million), Tennessee’s Chris Johnson ($12.0 million), Oakland’s Darren McFadden ($9.685 million), Seattle’s Marshawn Lynch ($8.5 million) and Houston’s Arian Foster ($8.25 million); Charles’ cap hit for 2014 is slated to be $4.83 million and jumps to a reported $7.33 million in 2015. You’re always one knee injury away from regretting such a long-term investment, especially on a tailback, but the only thing more remarkable than Charles’ production and skill-set has been his durability. Based on the numbers charted by FootballOutsiders.com, the Chiefs’ star played on 55 percent of his club’s offensive snaps last year (577) and has appeared in 84 percent of them (795), to date, this fall. "I take every option when I’m being hit: ‘Don’t be the hitter, don’t get hit, you’ve got to hit them first before they hit you,’" Charles says. "Every time I step on the field, I try to play hard, run tough and try to kill people sometimes. I mean, that’s how you’ve got to take, it, because when they get an opportunity to kill you, they will. So you’ve got do it when you have a chance." The 27-year-old Texan needs three more touchdowns through the air to become the first NFL back to ever rack up 10 receiving touchdowns and 10 rushing touchdowns in the same season. He’s 36 receiving yards and 10 catches away from passing Holmes’ single-season club marks for receptions by a running back (74) and receiving yardage by a running back (690), both set in 2003. 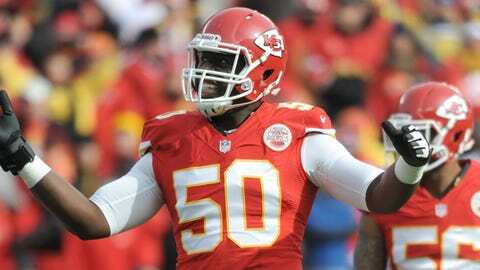 "You know," Stephenson continues, "Jamaal is more than just a running back." He’s a pillar. A bastion. A value buy. The Spotrac.com database says Charles makes $117,647 per 2013 league week; that’s a third of what, say, McFadden is raking in at the moment. It’s going to be an uphill battle fighting sentiment toward Denver’s Peyton Manning in the race for Most Valuable Player. But few NFL stars can match Charles when it comes to providing the most bang for your salary-cap buck.